This listing is for a New RJS Racing Equipment 4 Point Off Road Harness. The Non-SFI Harness has a 2" Pull Down Individual Shoulder Harness that wraps or bolts to the floor or roll bar running just above the floor.. The harness has 2" Pull Up Lap Belts with Bolt in anchors. 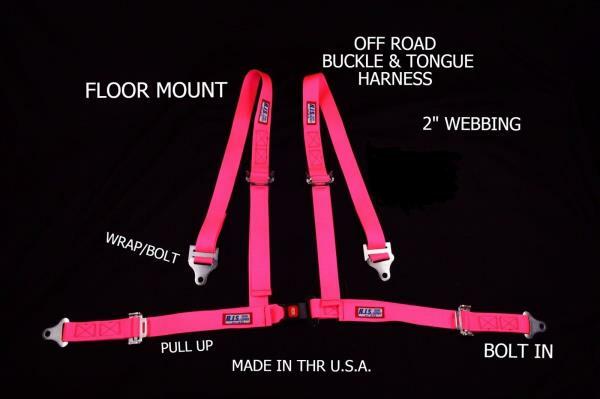 This harness is Hot Pink in color but if you would like another color please leave a note or message at checkout. The price is still the same for Black, Blue, Red, Orange, Yellow, Gray, Purple, Green and Hot Pink. This harnesses is manufactured by RJS Racing Equipment out of The Motor City since 1959. One of the last American companies still offering American made products to the world. This item is NOT an overseas cheap manufactured part with a bootlegged SFI tag. Every Part of this belt is manufactured in Detroit, Michigan and assembled in Jupiter, Florida. These are sitting on my shelf, ready to ship to you today. I stand behind what I list. I offer a one year warranty from the date of purchase with proof of purchase. Returns are also accepted. I usually ship within 24 hours, I will ship internationally, but please international buyers do not send immediate payment until I can determine what the exact shipping charges will be and I will send an invoice. Please email if you would like me to quote for international shipping. I also offer the Global Shipping Program through eBay. I package everything extremely well so it will arrive to you safely. Please notify me within 24 hours if you receive a damaged item and save all the packaging materials. Everything I list is in stock and sitting on a shelf in an air conditioned environment. I recently purchased the entire overstock from RJS Racing Equipment so if you do not see an item listed, please feel free to send me a message. More than likely I have it. This also includes most of their new products as well that can be found on their website at RJSRacing.com. Most of all my items are available for a reasonable offer. ( seller defines reasonable ). Yes I will combine shipping on most items. If you have any questions, or would like additional photos, please feel free to ask. I want you to be happy and pleased with your purchase. In the event that you are not, or have any issues after receiving your item, please send me a message directly and we will come to a resolution. It is important to me that you are satisfied. Thank you for looking. Maybach Axed We’ve been preidtcing the demise of Maybach for some time. After all, who wants an old S Class with chintzy trim and lots of toys for more money than a Rolls Royce Phantom? And now it seems that Daimler has also realised their revival of the Maybach has fallen flat on its face (except in Germany and to a pair from the Dragons’ Den) and it’s time to move on. If seeing is believing, then the Detroit Institute of Ophthalmology (DIO) does their share of making new believers annually, including those who are visually impaired. Originally founded in 1972 by Dr. Philip Hessburg and his associates in Grosse Pointe, Michigan, out of a genuine appreciation for fine automobiles, the DIO gives credit to the designers who have given these cars their individual beauty. Don't be fooled by the Aston Martin-like grille and the stretched headlights--the Ford Focus electric has some serious green-car ethos. The Focus five-door hatch will be Ford's first-ever all-electric passenger car when it launches in late 2011. It can travel at speeds up to 84 mph and takes three to four hours to charge on a 240-volt outlet.